The Uttarakhand Subordinate Service Selection Commission (UKSSSC) has released an employment Recruitment notification for year 2017. The interested candidates can apply for Group c various post. The candidates interested in applying for UKSSC GROUP C post should have a 12 TH paas or graduate from a recognised university. For information visit the official website www.sssc.uk.gov.in. The age of the candidates applying for this post must not exceed 42 years and must be minimum 21 years. A written test and a typing test fwill be conducted for shortlisting the candidates acoording to post . The candidates interested in these posts are required to apply at the official website, www.sssc.uk.gov.in. Notification Date 3rd January 2017. Closing date for Online application 12nd March 2017. 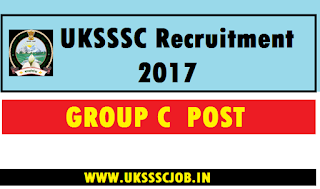 What is the starting date to apply online for UKSSSC Group C Recruitment.